A company will be created in which MAPFRE will invest 82 million euros for 50.01 percent of the capital, with Santander Insurance holding the remaining 49.99 percent. The bank will exclusively distribute the new company’s automobile, commercial multirisk, SME multirisk and third-party liability throughout the Santander network in Spain. 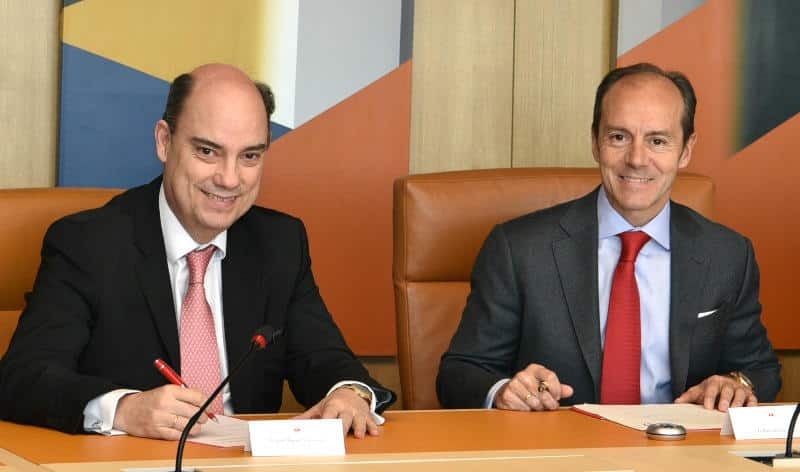 The CEOs of MAPFRE Spain, José Manuel Inchausti, and Santander Spain, Rami Aboukhair, have today signed an agreement through which the banking group will exclusively distribute automobile, commercial multirisk, SME multirisk and third-party liability throughout the Santander network in Spain until December 2037. Both companies will incorporate a new entity, to which MAPFRE will contribute 82.2 million euros in return for 50.01 percent of the capital. Santander Insurance will hold the remaining 49.99 percent. The alliance between the leading bank in Spain and the benchmark company in the Spanish insurance market comes on the back of a competitive process undertaken by Santander to seek out the most suitable partner to drive its insurance business forward. It is envisaged that the new company, the establishment of which is conditional on receiving the approval of the relevant authorities, will begin to commercialize insurance solutions in the fourth quarter of 2019.